We are more than a month into the year already and many people have taken the Christmas break as a chance to reflect on the past year and make plans for 2018. As every year there are a lot of new year’s resolutions made in order to become “a better person” or goals set in order to finally focus on what has been planned or desired for many years already. Frustrating enough, experience shows that most of these resolutions are dropped after a few days already, as they seem not achievable and therefore not realistic. Many people are well aware of what changes they want to make, but are simply not yet ready for it. Looking critically at the process many of us are going through at the beginning of every year we can conclude that personal goals work the same way as professional goals – if we are not fully convinced about their overall purpose and if we don’t see a realistic way to achieve them we don’t even need to set them. They will be dropped and forgotten as soon as they are formulated. The issue with most goals is that the steps needed to be taken by the individual are too big. Deciding on smaller changes that are easier to achieve provides the individual with small successes right away which will keep up the motivation to continue or even formulate the next step. relevant and specific, clearly measurable and time dependent. But what if we approach this question from a different point of view. What if we don’t only focus on the small changes that we want to make, but look at the bigger picture of ourselves for once? What if we come up with a whole new concept of ourselves? Let’s approach this question like a visionary would do. Imagine you could create an overall new personal concept. Think about who you are today – you as a person, you as a partner, you as a parent, you as an employee or entrepreneur, you as a friend, you being part of society… Who are you? 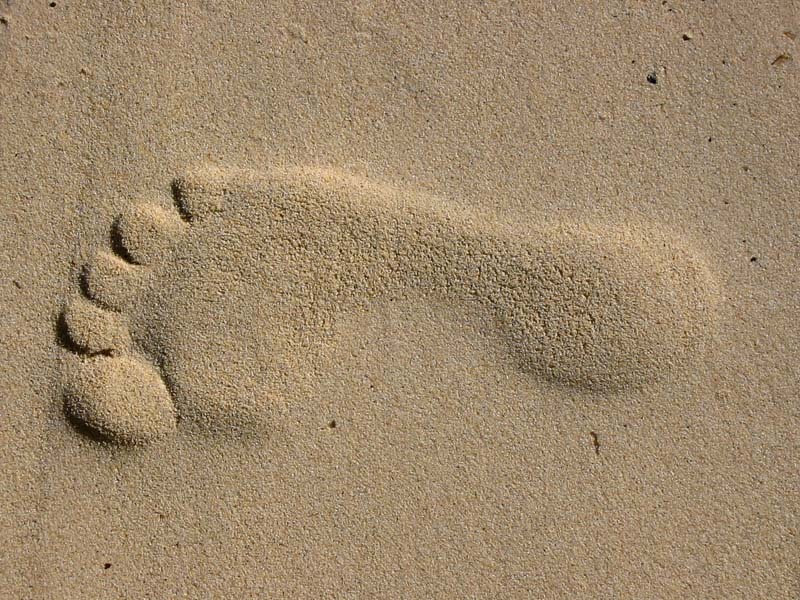 In order to lift the whole question to a more abstract level, think about your own ‘footprint’. The footprint metaphor is used in different contexts nowadays. We are talking about the ecological footprint of an organization for example or the social media footprint of a person or the economic footprint of a company within global economy. In essence it is about the influence you as a person, organization, company or group have in the different areas of your activities. So first of all look around you and inventory yourself as part of our society. Which roles do you have? What activities do you follow? What groups are you part of? With whom do you interact on a daily, weekly, monthly or yearly base? The more often and intense your interaction with others is, the deeper your footprint is in that specific area. The more interactions you have in total the broader your footprint is. So take a moment and think of your personal footprint today. It might take a bit of time. And you might be surprised to see the extent of the list of all activities and interactions you can come up with. Take a 360 degree view and look at all areas of your life – work, leisure, family, society, etc. Make sure you think of all facets of your daily life and think about how intense your interactions are in each area. The summary of all this is your current personal footprint. After this little exercise the next question is already waiting for you: Are you satisfied with your current personal footprint? Are you happy with the amount and intensity of interactions you have? Do you miss certain areas or do you feel that you are busy in certain areas you would rather not want to spend time on? If this is the case, this is the moment to come up with the new concept of yourself! You can either think of the little things you want to change or you think bigger and create a new concept for yourself – your new personal footprint. The advantage of looking at the bigger picture is that it is easier to visualize and therefore more motivating in the long run. So the bigger picture should be the first step before you look into the details that will take you there. Make sure you make a list of everything that needs to be done in order to reach your bigger goal. Getting there basically means questioning your current footprint in any respect – not in a negative but in an investigative way. Are you happy with all activities you follow? Do you spend enough or more than enough time with one or the other group? Do you miss doing things or being in interaction with others currently? Do you feel you have a good balance in all activities you follow? Are you stressed by certain things or people? Is life fun? Have you got goals and are you able to work on them at least from time to time? Are you motivated rather than demotivated looking at the future? By questioning yourself you’ll get easily to the areas that need improvement and change. Determining the need for change is the first step. The next one is to make a plan (having the bigger picture in mind) and defining the steps to get there. Again, these steps need to be small enough to be achievable but big enough to be motivating. Set a time frame for every step and talk about it with people you trust. Make sure to visualize the bigger picture regularly in order to fully take it in. You will have to say goodbye to some old habits or to activities you followed so far. Be prepared that you will have to disappoint one or the other, but also think about the positive effects of interacting with people or being busy with things you really like. Are you ready to create your future personal footprint?